When we come to a passage of Scripture, it's important to understand its original meaning — that is, what it meant in its original context. This gives us a solid foundation as we ask other hermeneutical questions. There are many different tools to help us discover what a passage meant for its original audience. So, what factors can help us discern the original meaning of Scripture? Well, a great number of factors help us discern the original meaning of Scripture, and a very quick summary of them would go like this: We have to attend to the context first. And then we have to analyze the passage. If we have a narrative, we see: How is it set up? Who are the characters? How do we move to the climax, and what comments are made in the narrative that show us what the main point is? With things like poems or letters, prophetic utterances, you have to follow the logical thrust of the passage. That's analysis. It's good to pause and consider. An ordinary reader should always make sure they're not skipping over things that they don't really know. You know, when it says, "they were fasting," are you sure you know what fasting is? When it says, "the Lord spoke," are you sure you know what that means? So, check out those sorts of things. Of course, we should always look for themes in the Bible. So, for example, we might look at prophets in the Bible — at the first prophets and subsequent prophets; and prophets that only speak; and prophets that speak and lead; and prophets that speak, lead and act, perform miracles. Or look to the great prophet, Jesus. We look at the way in which he was understood and misunderstood as a prophet. And of course we look at the ways in which the apostles would fulfill prophetic roles, and then ask, does that continue in any way today at all, even in a derivative way? That's a thematic study. Of course, we're going to always look for the main point as well and reflect on what do we learn about God? What do we learn about his redemption in this passage? So, you know, very quickly, that's context and analysis. And then identifying any problems we have, any themes that run through all Scripture and then reflecting on the main point. And we could leave application off to the side for the moment. So those are the big ideas. 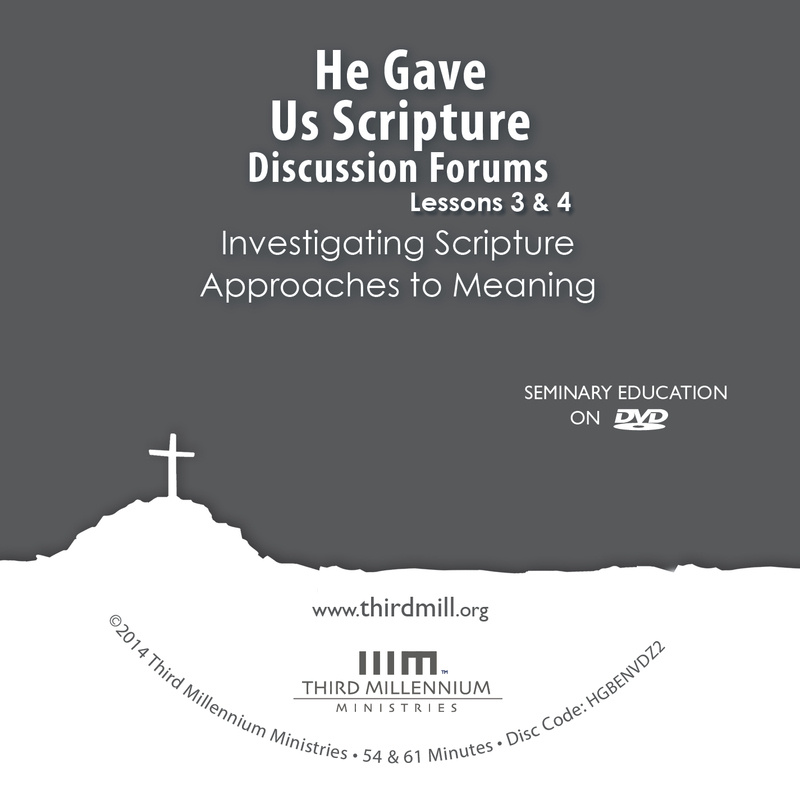 A very important question has to do with the factors that can help us to interpret the original meaning of Scriptures. The most important factor is literary context. That includes not only the verses that immediately precede or follow a given passage that we're studying, but actually the entire biblical book of which the passage is a part. The basic literary unit in the Bible for the most part — you might find certain exceptions like the book of Psalms or the Psalter — but for the most part, the basic literary unit of the Bible is the biblical book. Writers basically plan and write books. And that means then that context is not confined just to the passages that immediately precede and follow, which of course it is, and that's very important, very important indeed. But really, it's important to note how a passage functions, what role it plays within the whole book of which it is a part. So, I encourage my students as they work with individual passages to begin by looking at the entire book and get some sense, at least, as to what's in the book and how the book is laid out, and these kinds of things. Of course another consideration in terms of discerning the original meaning of passages has to do with probing the meaning of key terms that are used in the passage itself. And again, context is important here. I would begin by noting where else within the book the writer has employed the term. And this, of course, involves the use of concordances, which, of course, are lists of passages where various words are used within the Bible. So, already as you work with context, you begin to work with concordances. But also, how that word is used elsewhere in the Old Testament or in the New Testament depending on what testament you are working with. If possible — and if people have the ability to make use of resources that will aid them in this regard — it's well to note where the same Greek or Hebrew term is used … And then, looking at one or two commentaries, at least, and interacting critically with the commentary. Not simply accepting what the commentary says, but having read and worked closely with the passage itself and the use of the words, at least, of that passage, to make use of commentaries and to engage in a conversation with the commentator. And it's out of that conversation with a commentator — not simply accepting what the commentator says, but noting what the commentator says in terms of interpretation and the reasons the commentator gives for that — the way in which the commentator makes use of the passage in its context will help greatly. Another value in use of commentaries is that good exegetical commentaries — that is to say, commentaries whose purpose is actually the interpretation of the text — will make accessible certain types of evidence or certain considerations with regard to interpretation that it might be difficult for readers of the Bible to find otherwise, especially historical background sorts of considerations. To develop the skills, again, one, we need to go back to 2 Timothy and to study "to show [ourselves] approved." The passages, again, will go back to the interpretation that there can only be one truth in that interpretation … But again, I always go back to the humility and the reverence of God's Word. One of the acronyms that I use as I teach Bible interpretation is called: "T.H.E. R.O.A.D." And THE ROAD is used in the historical-critical method of interpretation. The "T" is the "type." So, Scripture is going to be… whether it's literal or figurative. Is it didactical? Is it poetical? We have to understand when we read that that the Bible is made up of all genres of Scripture which can affect the interpretation. The "H," the "historical," then, we look at the geography. We look at plant life and animal life, and all those things, again, will have an effect on how we interpret Scripture. And then we have the "Event." The event is whether is it a wedding. Is it a funeral? What is going on here? And then the "R" is the "recipients." Who was being spoken to? What are their lives? How did they live? And then the "O" is going to be the "occasion." Why is this going on? Are these the Jews in the diaspora that are getting ready to face persecution under Nero? And then the "A" is the "author" and what are the circumstances of the author? Is he in a Roman jail as he writes his epistle? And then the "D" is the "date." When did this take place? What is going on in history at this point in time? So, we're blessed today to have a lot of tools available to us. But again, I can't emphasize enough the humility and the reverence and the respect of God's Word and using those tools in line with my love of God. We can ensure a responsible interpretation of a biblical text by seeking to discover its original meaning and by examining the text itself. To do this, biblical interpreters have relied on what is called "grammatico-historical exegesis." What do we mean by grammatico-historical exegesis? One of the wonderful things about the Bible is that God is able to speak through it to people who have little understanding, who have little background, and yet love God and want to know his Word. However, the Reformers, as they looked at some of the excesses of biblical interpretation — where people were simply making the Bible say whatever they wanted it to say — they determined that we need to ask two questions about the Bible. Number one, what does it say? And that's the "grammatical" question. What is the language saying? God chose to say it this way. That's important, and we need to understand. Is it past tense? Is it future tense? Is it feminine? Is it masculine? We need to answer those grammatical questions to understand what the text is saying. They then said there's a second question that we need to ask, again because of the nature of the Bible, and that's the question: What did it say? What was the initial point that was made in that historical context? They said if we know the answer to those questions — "What does it say," the grammatical; "What did it say," the historical — we're now in a position to answer the third question: And what does it say to us? Grammatico-historical exegesis is a way of summarizing in short form an answer to the question, "How is meaning to be found in a text?" We insist that there is meaning to be found, and we insist that meaning is going to be derived from the text itself. Well, how does that happen? Well, the word "exegesis" is simply a word meaning "to explain," "to draw out," and we're drawing out meaning from the text. It's not from the author independently of the text. It's not from the reader independently or even in conjunction with the text, but we say the text says something. How is that meaning to be drawn out? Well, "grammatico," that captures grammar. We attend very carefully the words. What do those words mean? Those words in relationship to one another, at the very simplest level, word-to-word; we call those "syntactical relationships." And then we expand; we look at clauses and sentences and paragraphs and much larger units of discourse. "Historico" means that a text is written at a particular place, at a particular point in time, by a particular author. And meaning has to be understood in the context, in that historical context that I've just outlined … We do insist that the Scripture has something to say to readers in all times and all ages, but it had to have meant something to the original audience. And its words, its meanings, its reference, of course, have to be understood in that historical context. And once we come to terms with the grammar and with the historical context, then we're in a position to say, "This is what the text means," and then we can make application to contemporary audiences. Grammatico-historical exegesis is the norm for exegesis through the years. It means that we believe that an author has an intent in a passage and that we should discover it by using the means that would get us closest to the mind of that author. So how do authors express ideas? Well, they do it through writing, through sentences, through words that carefully chosen, through sentences put together to make paragraphs and then clusters of paragraphs. And we simply try to follow that, and we do that by looking at things sentence by sentence… So we look for words like "therefore," "so," "thus," "if," "then," "when," "whenever," "although." Words of that kind which clue us into the meaning and the flow of thought in the author. We also assume that an author chooses words carefully. There may be a small difference, but there is a difference between, say, "perseverance" and "endurance," or "heart" and "bosom, and "body" and "hands." So we ask, how does an author use these words? What connotation is behind these? And so we're operating with the lexicon and we believe that the word "endure" has a certain meaning, and "abide" has a certain meaning. And they're close but not quite identical. And we give the author credit and try to ask what they were up to with their word choices, not assuming that every word choice is vital. Sometimes we alter words just for the fun of it. Historical exegesis means you don't put someone in the wrong era. And so if somebody refers to kings, we try to remember that in those days kings were leaders. We may live in a country where there's a president or prime minister, but a king was the leader. And we simply try to remember that's the way it was. Or if it refers to slaves in the Bible, we have to remember that most cultures for millennia were slave cultures, or at least had large numbers of slaves. The Bible isn't necessarily approving that or endorsing it, but it's describing the way reality was. And so we don't ask the Bible to be something that it isn't, and that is, something that's detached from its cultural, historical moorings. When we consider the Bible's original meaning, we're actually looking at it from several vantage points. One of those vantage points involves the original author of the passage we're looking at. How does information about the writer of a biblical book help us understand the book's original meaning? The information about the author of a biblical book is of great help to us as we try to understand its meaning. And this is because the Holy Spirit — in the way that only the sovereign God could — used human individuals in their personalities, in their background of experience, to deliver his inerrant Word. And often when we can get some sense of how he formed the human author to be the one through whom he would speak the word, it enriches our understanding of the text. I think of Psalm 42 and 43. I call it "Psalm" because although we number them in two, they really go together. That motif — "Why are you downcast, O my soul? Why so [disquieted] within me?" — ties them together … We're told that this is a psalm of the Sons of Korah, and we know that the Sons of Korah were among the temple singers. When you hear it as a psalm, first of all, spoken, sung in a kind of lament, by one associated with the singing of the temple, then it gives special meaning to the longing, the poignancy of his not being able to be in the sanctuary now. He remembers when he led the procession. The fact that, as he refers to it, he seems to be up on Mount Herman, the headwaters of the Jordon, far from Jerusalem. And you begin to feel a little bit more how this psalm refers to that longing of one who is accustomed to the presence of God and being in the praises of God's people, feeling that kind of longing. Or Psalm 51, a classic, the song of David's repentance and of his recognizing his terrible sin against his faithful soldier Uriah with the taking of Bathsheba, and that confession. That whole psalm just comes alive as we see it as a confession of a king who is a man after God's own heart and yet who has sinned grievously but finds forgiveness in God. Or think of the New Testament. Think of the apostle Paul. We think of him obviously as the champion of the gospel to the Gentiles. But when we think about his earlier history, the fact that he was a zealous Jewish leader of the Pharisees, that he persecuted the church, as he mentions in his letters, that's to him the sign that he's the chief of sinners, the least of the saints. He persecuted the church. He will bring that experience right in and say, "I am the great exhibit of how gracious God can be to one who was his sworn enemy. I didn't know I was his sworn enemy, but I was. I'm also the sign that the attempt to win and keep God's favor by keeping the Law given through Moses is an absolute dead end" … "What I thought was gain," he says to the Philippians, "I realize now is loss and rubbish." So his experience is woven right into his letters, and that enriches our understanding of those texts. Well, to appreciate the meaning of a book, it's important to understand the background of the author, because the author gives us a certain angle from which the story is being told. For example, Matthew is Jewish, very Jewish. And he is engaged in his gospel in dealing with disputes between Judaism and Jesus, because Jesus is presenting himself as the completion of Judaism. He's not trying to break away from it. The breakaway happened because of Jewish pressure against Jesus and the movement that he founded. So knowing that Matthew is Jewish helps us to understand why, for example, he speaks about the Law so much and issues related to the Law. Contrast that with Luke, who we're pretty confident is a Gentile. In fact, he may be the only Gentile writer in the New Testament. When he comes to the Sermon on the Plain — which is his version of the Sermon on the Mount — all the legal stuff is gone, and the only thing that he's teaching are the moral emphases that come out of that sermon — to love your neighbor and to pray for them and the description of the blessings and woes of the character of the person who's in the kingdom of God, that kind of thing. But the six antitheses, which Matthew has — "You've heard it said unto you… but I say unto you…" — where there's a contrast between what was taught and what Jesus is teaching in driving the Law deeper, those are all gone except for one, and the one that remains is the exhortation to love your enemy. That, in part, has to do, I think, with both the background of the writer and the audience to which they are writing, because… in one case the writer is Jewish, and Matthew is writing primarily to a community that cares about Jewish issues, and the other writer is Gentile, and he's writing primarily to an audience that cares about Gentile issues. And so that background helps to explain why we have some of the things we have in the books that they write and why we don't have other things. I think one of the things that's necessary in interpretation is to understand the historical background of the book. And I think in some circles there is this idea somehow that the Bible just fell in our laps, as it were, so that it speaks directly to us and so that, therefore, we can apply it directly to our lives. But I think, when we do that, we often miss the intended meaning of the Bible by failing to understand the background and the uniqueness of a particular author … The point being is that we need to understand the context, for example, of the situation in Corinth before it can be properly applied in our present situation. He cited the example of how the "love chapter", chapter 13, often when people read it in weddings, it has this connotation that it's quite romantic, ideal. But if you study the book of Corinthians and know the context of that church, they had all kinds of problems that happened in that church, so that if you read chapter 13, it comes out like a rebuke to the people, you see. And that's what I mean. You know, if you understand the context, it has a forceful application, better application for our time than if we just ignore the context. As we look for the original meaning of a text of Scripture, we should always keep the writer in mind. At the same time, we can learn a lot about a passage by considering that writer's earliest audience. How can information about a biblical book's original audience help us understand its meaning? I think when we read the Bible we have to be aware that it was written to specific people, in specific places, in specific times, with specific questions and issues. And so, knowing something about that context can be extraordinarily helpful. Now we have to be honest, sometimes we don't know exactly the context that, say, James or Paul is writing to. Now, we can put a lot together. For instance, we can see that it's pretty clear that James is writing to a Jewish audience, a Jewish Christian audience. And they're experiencing certain things that James is addressing. We know the places, generally, that Paul's writing to. And sometimes we know more about what was going on there. What we know is what the biblical authors tell us, and I think that's the important thing to remember. It can be really helpful to have general historical information about a place or a time. That can be very helpful. But nothing is more helpful or more important than what we know from the biblical writers themselves. So we need to be aware. We need to be aware of the situation they're writing to as they tell us about it and… we don't want to build a historical situation that might have existed. And so the best thing to do, and the thing we should do, is stick with what we know, like, say, about Galatians and who Paul's writing to and what they're experiencing and how that affects what he has to say to them. You know, the question "what is the gospel?" is an important, crucial question for Christians, but it's not an easy question to answer unless we really know who we're talking to. We can think about how important it is to communicate that the gospel is about the death and resurrection of Jesus Christ for the sins of God's people, and that's a critical aspect of what the gospel is. But what's really interesting as we think about the importance of the original audience is that Paul writes not one tract about the gospel that he uses in every place, but he actually writes thirteen different letters. And in those letters, it's really interesting how he summarizes the gospel in different ways depending on who he's speaking to. So, to the Galatian church and to the challenges and the opportunities for the gospel in the region of Galatia, Paul focuses in on different metaphors like, Christ is the seed of Abraham, or that the gospel is about our justification. As the Gentiles are coming into the church, it's important to understand that they don't have to become culturally Jewish, but they're justified by faith in Christ. But it's really interesting that Paul doesn't say anything really about justification to the Thessalonians or to the Corinthians. The challenges of Christian identity, the opportunities for the mission of the church on the stage of Corinth, are really quite different than the region of Galatia. And so, when Paul summarizes the gospel to the Corinthian Christians, he talks about how Christ is our "Passover," and so, in dealing with sexual immorality in the church, they are to get the leaven out of the church. Or Christ is our wisdom. As they deal with factions within the church, and following the rhetorical prowess of different leaders, they have a false view of wisdom … And so it's very helpful for us as we read the Bible to understand the original context as much as we can, to understand why the gospel is being summarized in different ways. There are real benefits in knowing the original audience. For example, the book of Revelation, they are experiencing real persecution. The book of Hebrews was written to Jewish Christians working out whether they're going to go back into the synagogue or embrace the Gentile church. So this is always going to really add value. Or the Corinthians. They're living in a culture where there's lots of new money around, people are "on the make," people are in law courts against each other, and it's a difficult culture. And so when we read a letter like 1 Corinthians, we can begin to see which the points where Paul's words would really resonate, or touch deeply, or connect with the original audience. And there may be places which don't really connect with us, but it's useful to actually realize where the hot spots are, if you like, in the latter. So that's really valuable. Our knowledge of audiences is, of course, speculative. We don't always know who was getting something or what they were thinking. Nonetheless, it can be very helpful if we do know … A book like Genesis describes very early events. But Moses was writing it for the Israelites as they were about to enter the Promised Land and reminding them, God's the Creator of all things and he's the forefather of our nation. He established our nation so long ago. Our identity does not come from being enslaved in Egypt. It comes from being called by God. And then you can also ask the question, "What did people know?" Some books might have been written for people who were pretty ignorant … The book of Luke is written consciously for a man named Theophilus, so he could have certain knowledge of what he'd already heard about. So here's a man who knew some things and Luke is trying to take him deeper. And then, of course, we have the knowledge that some books were written for those who were struggling with all kinds of questions. The Corinthians' correspondence is a clear example of that as the book marches through the difficulties that they themselves had asked Paul about in the letter, and the difficulties he had heard about. And he answers them one by one. Of course, a book like Galatians is written for a very hot controversy, where Paul had preached the gospel, and then some other people — the "Judaizers," we call them — perverted the gospel, and so Paul has to reestablish it. And so, what we have to do is be aware of the separation between the time when an event occurred, and when it was written about, who read it, on the one hand. On the other hand, we have to know that some people were just ignorant, and we want to fill them in. And others were not ignorant but deceived and had had their faith perverted and it had to be corrected. We know that biblical authors wrote to specific audiences with specific needs at specific times. And these audiences impacted the way the authors wrote or structured their texts. But how did biblical writers deliberately accommodate their material to make it more meaningful to their original audiences? When we come to the Bible, we find what we have there is inspired Scripture. So, we can say this is the Word of God but we can also say these are words written by inspired human authors. It's sometimes called "dual authorship" or "concurrent authorship." And because of that, the human authors are writing in a particular historical context, to particular people, and they apply the timeless truths that God is inspiring them to write to those particular situations. Now, in so doing, for example, let's say in 1 Corinthians 11, Paul is instructing the people about the issues of the way women are to respect their husbands, the proper male and female gender roles in the church. And within that particular culture, one of the ways that a woman showed respect to her husband and submission to her husband was to cover her head. And so Paul gives instructions on head-coverings there for the purpose of applying that timeless principle of submission in marriage and male and female gender roles in the home and the church. I don't know that I would call that accommodation more than a cultural application. And we realize that there's a cultural veneer to that timeless principle. So in other words, if my wife were to wear a veil here in Kentucky and people saw her, they wouldn't say, "Well, now there's a woman who respects her husband." They would say…"Why is she wearing that on her head?" But by my wife taking my last name, by my wife wearing a wedding ring, by the way my wife interacts with me, she communicates an acceptance of biblical teaching on gender roles in the home and the church. Growing up in the church, I remember how my pastor, when I was a young boy, would get down on one knee and would look me right in the eye and would speak to me on my level and how much that meant to me that he would take the time to stop and to talk to me, and to talk to me in a way that I could understand. And in doing that, he was really following the example of the biblical writers and how they have accommodated what they want to communicate to God's people in ways that they can really understand. And so, Moses, when he's trying to communicate about the covenant that God has made with his people, he chooses treaty forms that they would understand, land-grant treaties of the day, when he's talking about how God's given a land to the people of God. Or we think about the pain of the exile and how excruciating and horrifying it is to be torn away from your home and then to have the prophets and the Psalmist choose the form of lament and how the people of God can cry out to God with their tears. And they ask the question, "why?" They can ask the question, "how long?" And the biblical writer is meeting the people of God right where they are emotionally … So the biblical authors really chose forms of literature that meet the audience of the people of God right where they are. It's a great question to try and determine how a biblical author accommodates their writings to the audience that they're writing to. Again, it's very important to think of the audience as a constituent purpose of what the author is trying to do. The author is always writing to a specified audience. It may be general, or it may be highly specific to a particular locale. I was just the other day lecturing on the book of Revelation, and we often think of it as an acontextual book that talks about strange and various future things. And yet, very carefully, the author in chapters 2 and 3, John, tells us who his audience is. He records who the seven churches are, and these are all churches in Asia Minor. We can learn a lot about their own historical circumstances, even the archeological realities of their locales. And what we can see is that he's addressing each of those seven churches, especially in chapters 2 and 3, Jesus is giving a vision through John that concerns the specific situation of those churches. Whether they're going through persecution, he encourages them through persecution. If they are enamored with wealth, he challenges that. If they've lost their first love, he mentions the need for them to reclaim that. And so, again and again the author is conforming his message to the particular audience. Biblical interpreters have varied in the amount of emphasis they placed on original meaning. And some of the views that were held during the Middle Ages still affect us today. During the Middle Ages, was the emphasis placed on the original meaning of Scripture more or less important than church tradition? Regarding the study of the Scriptures during the middle ages, we have to remember first that the Bible was forbidden for ordinary members of the church. There was not much emphasis on the study of the Word. But also, we need to keep in mind that during this time there was not an emphasis on original language studies. The Vulgate was translated by Jerome around the years 400 and 405 in Latin. And that was basically the official translation used by the church in Rome during this time. But there was not any emphasis on studying the Greek, the Hebrew, or the Scriptures in their original language … But Erasmus was a humanist. So he, at the same time, had an interest in studying the Word in Greek, and he produced a translation from the original language. Erasmus made the first translation of the New Testament in his day from the original Greek language … But from Rome, the emphasis was on the tradition of the church which could tell you what you should do or not do … God's Word is the ultimate authority. Everything else is under the umbrella of the word. The Word determines the right from the wrong. Tradition can be followed if it agrees with the Word. Otherwise, it has to be rejected. During the Middle Ages, I don't think most Christian interpreters completely lost sight of the author's meaning of Scripture, but it was certainly much less important in their exposition. And so, during the Middle Ages, what was called the "fourfold interpretation of Scripture" became popular. It was understood there was an original authorial historical meaning. Then there was a spiritualized or allegorized meaning. Then there was a moral level of interpretation. And then there was an eschatological or heavenly level of interpretation. And interpreters saw it as more skilled for them to develop those other levels of interpretation. They had certain safeguards. They had to be within the bounds of orthodoxy according to their understanding. But what resulted was, often — from our perspective — you would read it and you'd say, well, some of your conclusions there on the nature of Christ are right on, but that text doesn't really say anything about that. I can think about one in particular. In Genesis 18, the three visitors that come to Abraham. You know, just reading the text as it is, it appears that one of them is a Christophany — represents the presence of the Lord — and there are two angels. But throughout the Middle Ages, this was widely used as a proof text for the Trinity. And Luther, in discussing this, he says, now doctrinally that's wrong but rhetorically that's a nice embellishment. So, even with the Reformation and return to the author's original meaning, they were struggling with these long histories of these texts being used in other ways. Every book of the Bible has been copied many times since it was written. Until the invention of the printing press, the only way the church could make the Scriptures available to more people was by copying the texts by hand. But sometimes the people who copied these texts made mistakes. So, what does this mean for us today? Has the text of the Bible been corrupted over time? When it comes to the text of Scripture and its preservation and purity over time, there are two different ways to think about it. The first way to answer this question is, no, the text of Scripture has not been corrupted over time. We have textual witnesses for both the Old Testament and the New Testament in abundance that record and testify to the truthfulness of Scripture, the purity of the manuscripts that we have received throughout the ages… Now, on a second level we could answer that question, "Yes," in terms of the transmission of the text, the copying of the text, the hand-copying of the text, over thousands of years. Have small textual corruptions, misspellings, word inversions, words dropping out, occurred over the hand-copying of texts for over a thousand years? And the answer to that question is, yes. There textual omissions, textual changes that appear in our Old and New Testaments that are slight. None of them have to do with any significant points of doctrine. Usually they relate to the spelling of a word, the absence or presence of the word "the" or "and" in a particular sentence. But the nice thing is, because we have such a wide body of witnesses both for the Old and New Testament, we're able to compare manuscripts and identify to a very good measure what the original reading was and, therefore, what reading to maintain. And so, we have scholars who are dedicated and devoted to that. And over my 20 years of studying the Old Testament text, every instance of what I considered originally to be a slight error or change in spelling has always proven to me — in terms of my discovery of the answer to the problem — the truthfulness and the veracity of the text. Not once have I ever encountered anything that would say, "this is a major problem," "this violates what I've been taught to believe." In every instance, it's always confirmed that the tradition of the text is stable and that the testimony of church history is valid in their attesting or holding to that text. People like to talk a lot today about whether the text of Scripture has been corrupted over time because, obviously, the Bible comes — well, even the New Testament — from the first century, and we live in the twenty-first century. And for fifteen hundred years, fourteen hundred years anyway, it was, as were all ancient books, it was copied by hand before the development of printing. And so, people want to suggest that, in that copying, it has been corrupted. And the plain answer to that is, absolutely no. And all the evidence points in the direction of "no." We have manuscripts — of course, some of them are fragmentary — that go all the way back into the second century and even into the early part of the second century … But in all of the history, all of those from the second century, from the early second century until the Bible was printed in the fifteenth century — the whole history we have — there's not a corruption in the text of the New Testament. Yes, scribes sometimes made faux pas, true, but there's nothing that has corrupted the basic message and text of the New Testament. If you took the manuscripts that have the most scribal errors in them, we still have essentially the same thing as we have at the beginning. And it's important, particularly with the New Testament, to compare this with other ancient books. Nobody says that we don't really know what Aristotle wrote, or that we don't know what Plato wrote. And we have thousands of New Testament manuscripts. Granted, all of them are not complete New Testaments. For summary ancient writings of Plato and Aristotle, we have six or eight, or ten, or twelve. And so, if we know what was written in any ancient book at all, we know what was written in the New Testament because the evidence for it, the manuscript evidence for it, is absolutely overwhelming. Well, the issue of whether the text of the Bible has been corrupted over time or not depends on, actually, how you ask the question. If the question is, "are there a variety of readings at certain points in the text that we have from all the manuscripts we've collected?" the answer to that question is definitely, yes … And anyone who picks up a Bible and looks at their margin and sees the word "or" at certain points in certain verses sees some evidence of that. But it's not really a corruption of the Bible in terms of not having what it originally says, because we have a way of sifting through what those differences are. And most of them, in fact, are very, very irrelevant to the meaning. They are misspellings — that we, if we were typing, would call them "typos" — that kind of thing. They're easily spotted for what they are. And where there are significant differences, these are noted for people who have their Bibles, so they know the original text read either this or that. Inspiration, as we define it theologically, applies to what was originally written and not necessarily to the copies we have in our hands. That's an important distinction as well. The problem, I like to say, for students is that we have 105 percent of the Bible as opposed to 100 percent. And we've got to figure out what that 5 percent is to get back to the 100 percent. And there are ways scholars do this in making the choices between readings where there really is a choice and we're uncertain exactly what the text reads. When we get those places, we just need to pay attention to the fact that this text could be saying A or B and then read the text accordingly. In any situation in life, actions have consequences. And the neglect of certain actions has consequences as well. The same is true for interpreting passages of Scripture in light of their original meaning. So, what are the consequences of ignoring the historical situation of biblical passages? The most obvious consequences of ignoring the historical situation of any given biblical passage is the possibility and likelihood of misinterpretation and, therefore, misapplication. And the effects of that misinterpretation and misapplication can range from relatively innocuous to very dangerous. So you might, on the one hand, in sort of an extreme example, find yourself reading about Solomon's concubines and many wives and — if you're not careful to keep that in context with God's broader perspective on marriage and monogamy — read that and conclude, "well, evidently I should pursue relationships with multiple wives and concubines, as well." That's not going to make for a happy home. But you could think of other examples, as well, where you take the passage sort of lifted out of context, sort of treated in an ahistorical context as if there is no context. And so principles don't need to be developed or applied relative to some of God's commands for Israel and her purity relative to the nations. For example, should we still not be wearing cloth made out of two materials? Is that the one-for-one correspondence for us today? Or was that something indicating a way that Israel was supposed to be different from the nations? And then, might there be other ways in our context — not living in a theocracy — where Christians would want to make sure that we are distinct from the world in our pursuit of Christ and our value of God's claim on our lives, while also leaning into the world and reaching out with God's love? So we want to be careful. And it can be innocuous on the one hand. It can be very severe and detrimental on the other hand. But we always want to take care to give proper consideration to the original context in which a passage is written before we rush to make application of that to our lives. If we ignore the original cultural situation of a biblical passage we can basically read into a passage anything that we want, or anything in light of our own presuppositions. For example, the Hindu could read Jesus talking about being born again and think it's talking about reincarnation, whereas, in a first century Jewish setting, it meant something clearly different. Sometimes people have done this with ignoring hyperbole. Rhetorical overstatement was a common Jewish teaching technique. Sometimes people have ignored that in Jesus' teachings. Usually where it talks about, if you're in danger of lusting, the solution to that is pluck out your eyeball, most people I know have not taken that literally. But then the next paragraph goes on to say that whoever divorces their wife and marries another except for the cause of immorality — this is Matthew 5 — has committed adultery. And so there are churches that actually want to take people who are remarried and break up the second marriage, or break up the third marriage. And I think that's missing the point of the hyperbole in light of Jesus's other teaching on the subject elsewhere. It's not that you are to break up the other marriages; it's that you are to invite people, to summon people, to be faithful to their marriages. Part of what it means that God has organically inspired Scripture is that it arises out of particular occasions, of particular times in history. It speaks to issues that concern particular people who lived at a particular time and were struggling with particular issues. And if we neglect that then we are not doing justice to part of what God has actually told us about in his Word and that we need to take into account in order to understand the Scriptures rightly. We can go astray very badly. We can read passages that say things like "flee to the mountains"… if we ignore the historical situation of this passage, we can end up thinking that God is telling us to flee to the mountains and trying to figure out what it means to flee to the mountains today. And that may not at all be a proper allocation of that text. So that's fairly trivial. It's almost childish. But there are much more subtle and sophisticated versions of similar errors, and even the same error, that can happen if we don't do justice to the historical context. The Bible gives us, often, many indicators of the historical context or the occasion out of which the particular writing that we're reading has come out of. We must pay attention to that … Sometimes the historical situation is not very much in the forefront or is largely unknown. In those circumstances, I think it's better for us to think about the implication of why we're not given more information rather than trying to engage in a kind of highly speculative reconstruction of a supposed historical occasion, audience, author, and what was being addressed, and then let that drive our interpretation. If we're really committed to the idea that Scripture interprets Scripture and that… what God has given us in Scripture is sufficiently clear for us to understand it, then we ought to let where Scripture is silent also be a hedge, also be a discipline that we're willing to live within. Investigating the original meaning of Scripture helps us make responsible interpretations of Scripture. This means in our study of Scripture we always need to keep in mind the role of both the original author and the original audience through grammatico-historical exegesis. We should also remember the consequences of neglecting the original meaning. If we take the time to study the original meaning, we can work toward a responsible understanding of the text and identify and avoid improper interpretations of the Bible. Dr. Robert L. Plummer is Associate Professor of New Testament Interpretation at Southern Baptist Theological Seminary in Louisville, Kentucky.